Moving barges from the bridge site to St. Paul has broken up the ice in Lake St. Croix. 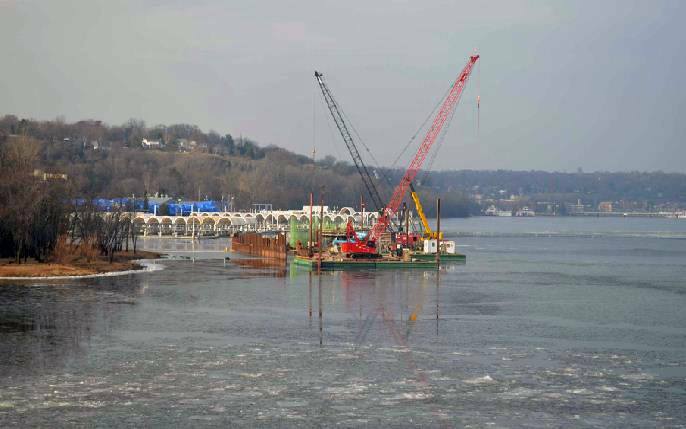 Area residents should be aware that on Wednesday, Dec. 4, St. Croix Crossing crews are moving three barges from the bridge work zone near Oak Park Heights and St. Joseph down the St. Croix River and then up the Mississippi River to St. Paul. This movement will break up any ice that has already formed, resulting in thin, irregular and dangerous ice conditions on the St. Croix River between Stillwater and Hastings, and the Mississippi River between Hastings and St. Paul. This is the final demobilizing of barges for the project this season. One barge will remain in the river until spring. Other barges and equipment will be removed from the river and trucked away from the project. Crews will continue to break ice near the bridge construction zone. Everyone participating in winter activities on the river should use extreme caution and stay away from the construction area. Signage about the thin ice will be placed at six river access points as well as on the St. Croix River both north and south of the bridge foundations. For your safety, please heed thin ice warnings.